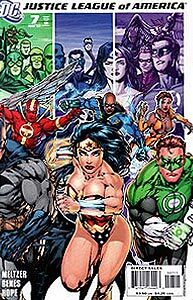 Cover Description: Members of the current Justice League pose before panels depicting previous eras of the Justice Leagues. Booster Gold is pictures among the heroes of the Justice League International era. Issue Notes: Booster Gold does not appear in this issue. 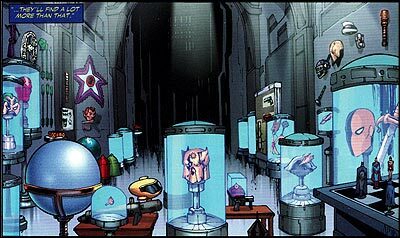 In the new Justice League's Hall of Justice in Washington, D.C., the Justice League's trophy room contains a deactivated Skeets robot. Though this Skeets looks much like Skeets II, it is uncertain how that model came to be deactivated and mounted in the League's trophy room like a stuffed boar's head.